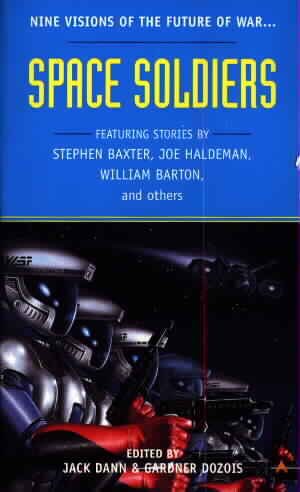 Space Soldiers, edited by Gardner Dozois and Jack Dann. A book review by jpoc. This book is another in the series of themed anthologies co-edited by Jack Dann and Gardner Dozois. It contains nine stories on the subject of war in space that were first published between 1965 and 2000. While it is not the best book in the series, it does contain some good stories and one absolute gem. The highlight is Stephen Baxter's "On the Orion Line" which is as good as space adventure gets. It's about a war between men and aliens who are able to manipulate some of the basic laws of physics. It is the kind of story that you just cannot leave in the middle and it's a great introduction to Baxter. As well as that tale, Paul McAuley, Alaistair Reynolds, Fred Saberhagen and Joe Haldeman all weigh in with interesting stories. Because of the wide time-span from which the stories have been drawn, most readers will find that a good portion of the stories are new and the editors provide biographical and bibliographical notes for further reading. If you like the hard side of the science fiction spectrum and you are not already familiar with the authors mentioned, you will find this book to be a good buy. If you want more of the same, I'd suggest the anthology "Nanotech" by the same editors which is an even better collection. Some good stories and one absolute gem.